Valentine's Day started off with work then a book reading at the library with Jessica Ralston. 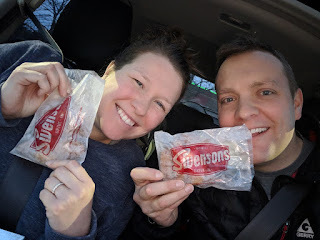 Then a nap and finished off with some Swenson's with my valentine: Dawn. Summer spent a few days at my parents, but picked up a bug and got homesick. So we went back Saturday to pick her up and we tried keeping things low-key at home while she recovered. 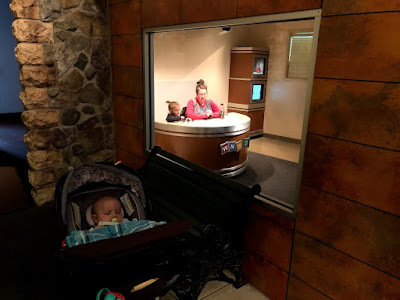 Summer and Evan watched movies, like Pinocchio, here. A cold start to the week and a mess is on the way. Today we will have flurries and light snow with temps in the lower 30s most of the day. Clouds will stick around most of the day today along with a brisk breeze. Clouds start clearing tonight with overnight low temps in the lower 20s. A little early sun Tuesday then increasing clouds and highs in the mid 30s. 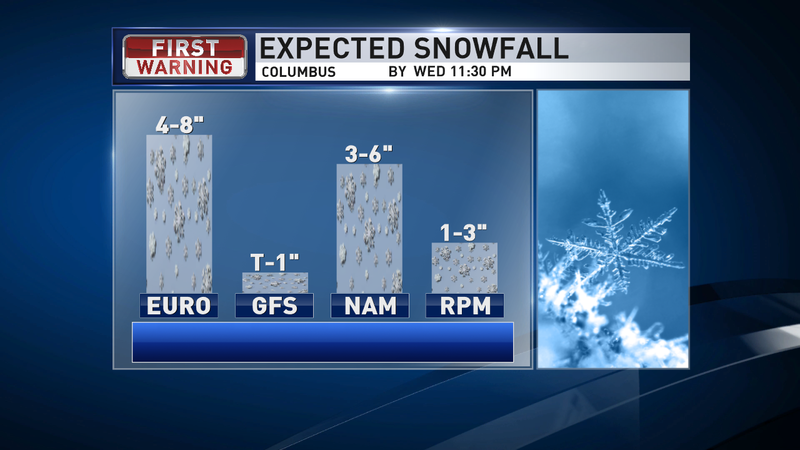 Snow moves in Tuesday night and we will wake up Wednesday with snow showers and snowy roads. Our temps will warm through the day and we will transition from snow to rain showers during the daylight hours. So snowy roads in the morning will become slushy and wet for the afternoon. A lingering rain shower or two possible Wednesday night, but it appears overnight temps should remain just barely above freezing, so wet/damp roads for Thursday morning. How much snow depends on the temperatures. How quickly we warm up will affect if we see an inch or a few inches. Be sure to check back into the forecast. 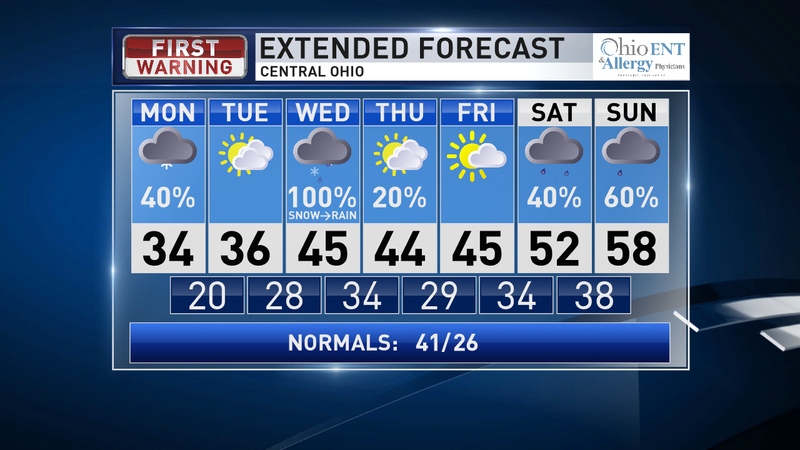 Mix of sun & clouds for Thursday and Friday with highs in the mid 40s. 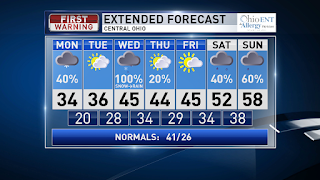 We warm up into the 50s for the weekend with rain showers likely. We may even give 60s a run for its money on Sunday. Cooler air will race back in for the following workweek though. Have a good one! I have said it before, I will say it again... 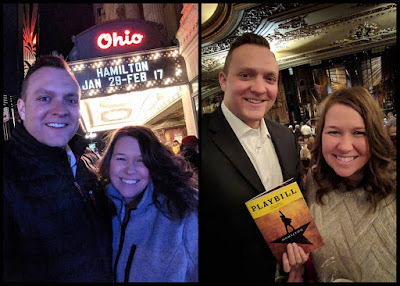 I LOVE Google Photos! 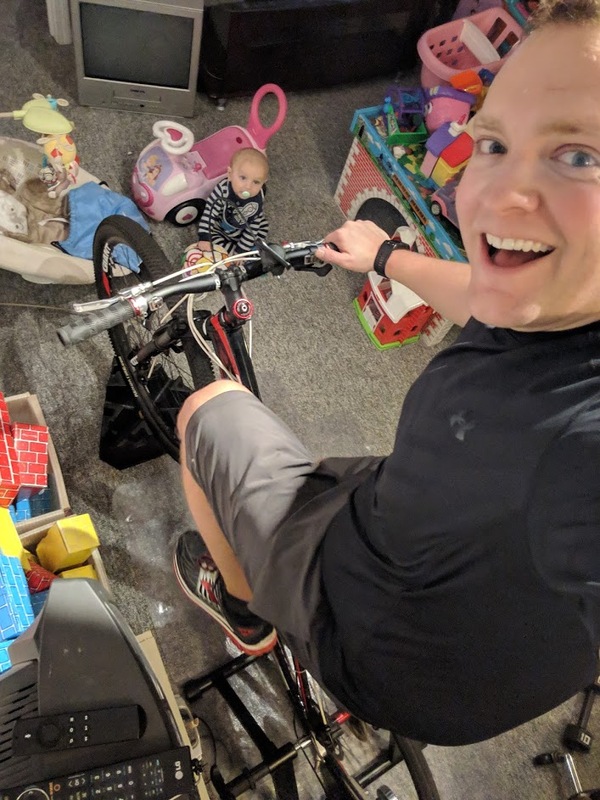 I go to bed early due to my early morning shift, so I miss out on the family hanging out. But then I get a notification that Dawn took some photos so I get to wake up and see photos like this. Love my three Valentine's! Evan has started sitting up on his own. So I am able to ride the stationary bike inside, with my foot injury, while he plays with toys. It is exciting times in the Michael house! I read Cloudy with a Chance of Meatballs at Horizon Science Academy last evening. CHECK OUT THIS CAKE! One of the student’s uncles made this for the book. Amazing job by CAKES BY TIMBO! River levels remain above flood stage in 8 counties across Central Ohio, so the Flood Warnings remain for today, but will start expiring later today as waters recede. Turn around if you encounter a flooded roadway today. Today will be a pretty quiet day for Central Ohio. We start out cold with increasing clouds and a cool afternoon with highs in the upper 40s and a little breezy. Scattered light rain and possibly a wintry mix overnight tonight with lows in the mid 30s. Temps should be warm enough that most of this precip will be rain. Our temps stay chilly Friday with damp spots early from the early morning rain/mix, but the clouds part some midday and then return again later in the day. Highs near 40 for Friday, so cool and breezy. We will see another system passing by to our south Friday night and early Saturday morning. 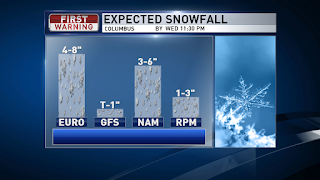 There could be some light snow accumulations in Southern Ohio, but the track has been keeping the snow away from Columbus. Most of Central Ohio roads will be fine Saturday, but some slick spots south early. 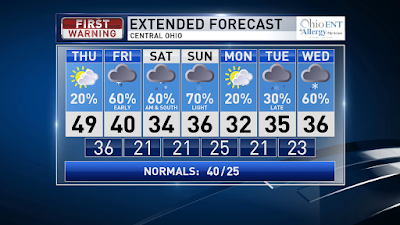 Decreasing clouds Saturday with some afternoon sun and highs in the mid 30s. Then we have a third system passing by on Sunday with a light rain/snow mix during the daylight hours. With this system being so light, it will be more of an inconvenience than a big impact, if you have any plans. 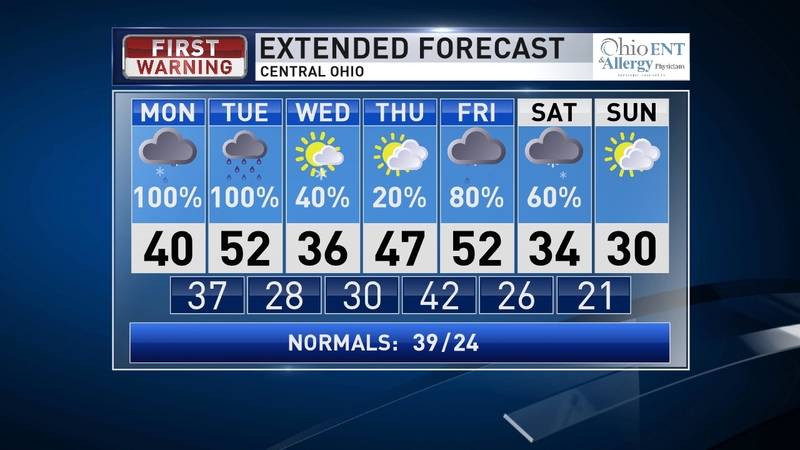 Snow looks to pass by across Northern Ohio and rain in Southern Ohio, so I-70 will be near the dividing line as if fluctuates with the rising and falling temps through the day. Stay tuned to the forecast this weekend for any adjustments to temps and possible precip type changes. 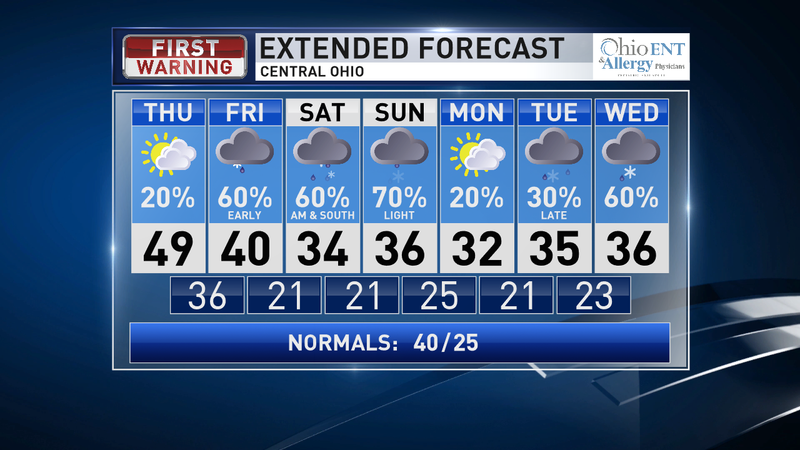 Monday is quiet with a mix of sun & clouds and highs in the lower 30s. Another rain/snow mix returns late Tuesday and Wednesday. Have a good one! 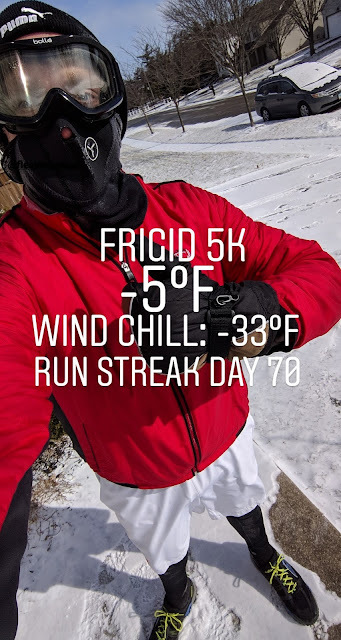 This will be one of my final runs for a while. It was in the rain, but I love running in the rain. 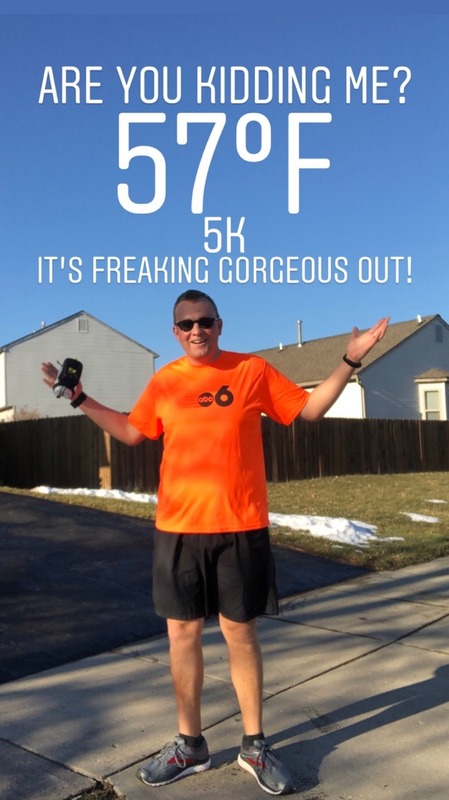 I have been running through some foot pain for a while. I went trail running last May and landed on the front ball of my foot a couple times on some rocks. I had on some cheap trail shoes and I regret that. Better trail shoes have a ballistic rock shield in the sole of the shoe to protect from sharp blows to the foot. Well... My foot became inflamed. I saw my normal doctor and chiropractor. 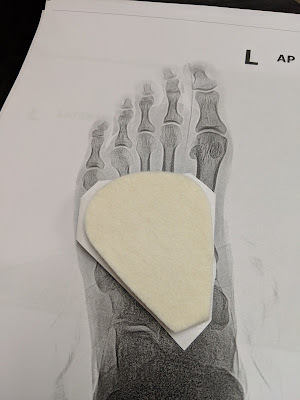 Their advice worked temporarily, but was not fixing my issue so Friday I went to a podiatrist. So my foot was inflamed and swollen between the metatarsals and phalanges and normal walking and dress shoes all morning long did not allow the front ball of my foot the rest needed to recover. 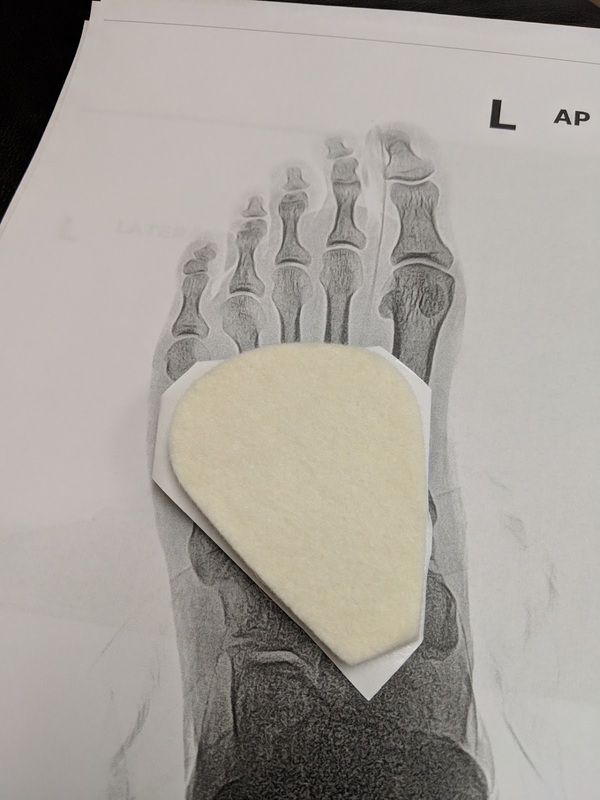 So I have to lay off running a couple weeks and wear this thick felt pad under the arch of my foot to let the ball of my foot float and take the pressure off. So far it has worked wonders and only had shooting pain once when I was barefoot. 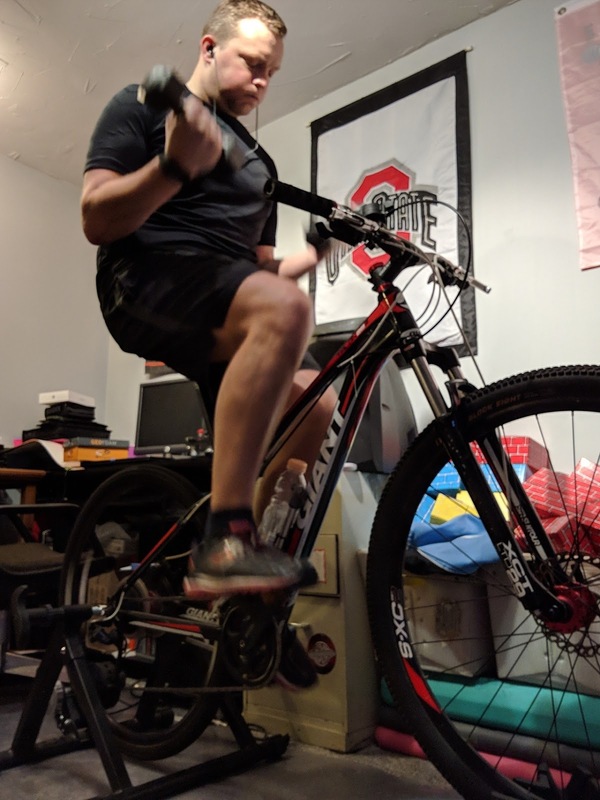 So now I am on the indoor bike stand and taking the time to pump some iron while I am at it. 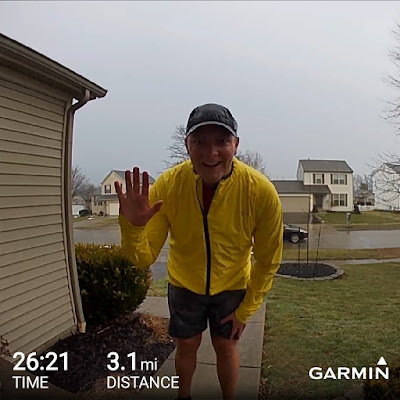 So I am sore in new places and I think a couple weeks off will be good for me to love running in a new way. 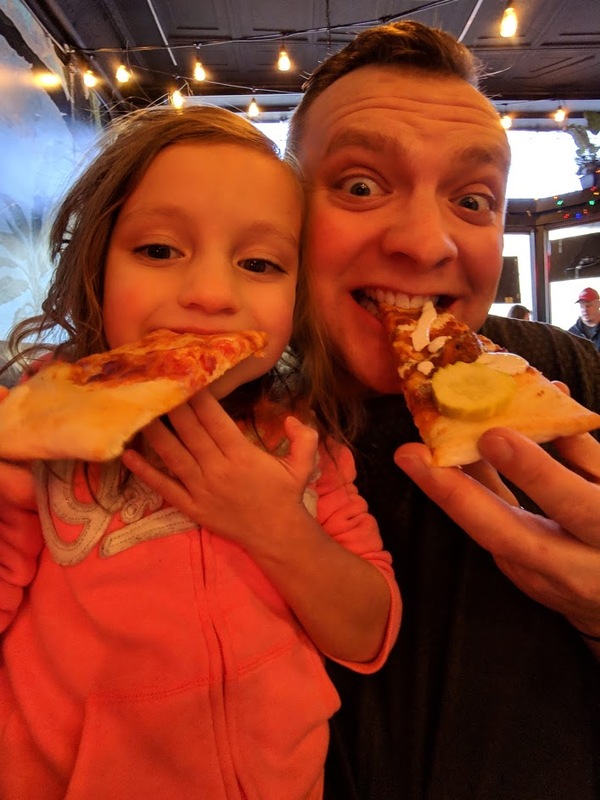 I had a fun time with Summer this weekend at the Hot Mikey's Takeover launch party on Saturday. She had cheese pizza. 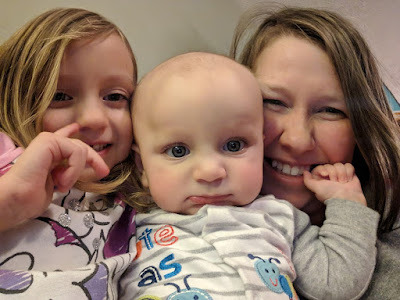 I had the kids all to myself Saturday night while Dawn was out with her mom and aunt. I had to get Evan's 5 month photo and for some reason put the blocks on 36 months for Summer... When in reality, she is actually 44 months old. My wife was like: uhhhhh why does it say 36 months? 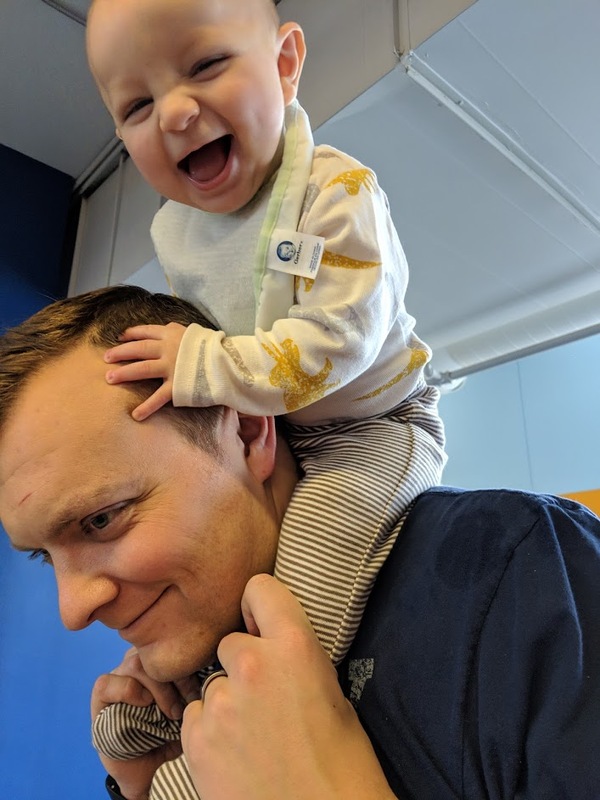 I barely got any sleep the night before because we think Evan will be cutting teeth soon. Oh well... The kids both looked at the camera for a photo... WIN! 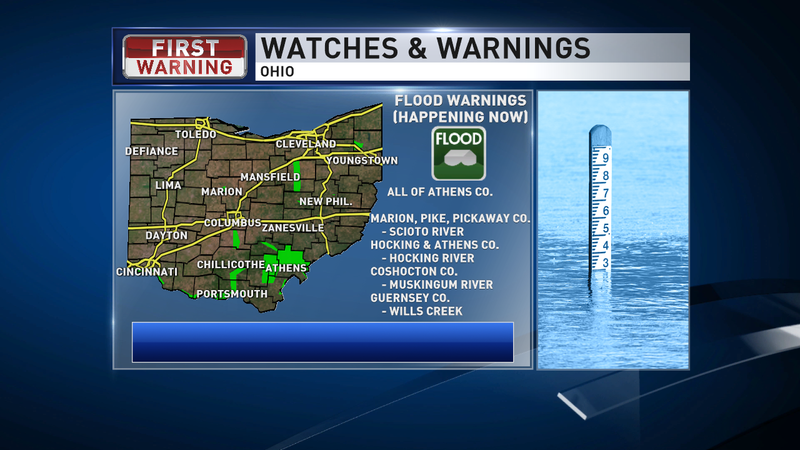 Flood Watch for Central and Southern Ohio thru midday Tuesday with 1"-2" of rain likely and flooding possible. The accumulating snow is done, but an early morning wintry mix possible followed by rain showers moving in from the south. The rain today will start in the south and slowly move north through the day and be widespread by this evening and stay widespread overnight into early Tuesday. Heavy rain is possible as well with 1"-2" expected so flooding in spots. The steady rain will become scattered on Tuesday and a cold front will pass later in the day and we transition over to pockets of wintry mix and light snow late Tuesday into early Wednesday. So a few light snow showers and flurries on Wednesday. Breaking things down a little more for the next few days: As far as temps... this morning we are starting out near freezing so the snow is packed into ice on the side streets and main roads, with salt, are in decent, wet status. 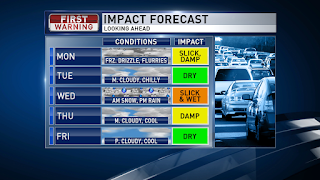 As temps warm later today, and rain moves in, we will see the main road stay wet and side streets become slushy as the snow melts and eventually clears as more rain moves in. We will warm to 40 for the high today. Rain becomes steady tonight with a low of 37. The warm air pushes in more Tuesday with highs in the lower 50s with the scattered rain. We will fall into the upper 20s by Wednesday morning with the light snow and flurries then a high of 36. Our winds will pick up slowly Monday and Tuesday with brisk winds likely late Tuesday into early Wednesday. Thursday is our quietest day of the week with mostly cloudy skies and highs in the mid 40s. However, rain does look to sneak in here late Thursday and more rain likely Friday highs in the lower 50s. Sound familiar? Guess what is next. You guessed it! 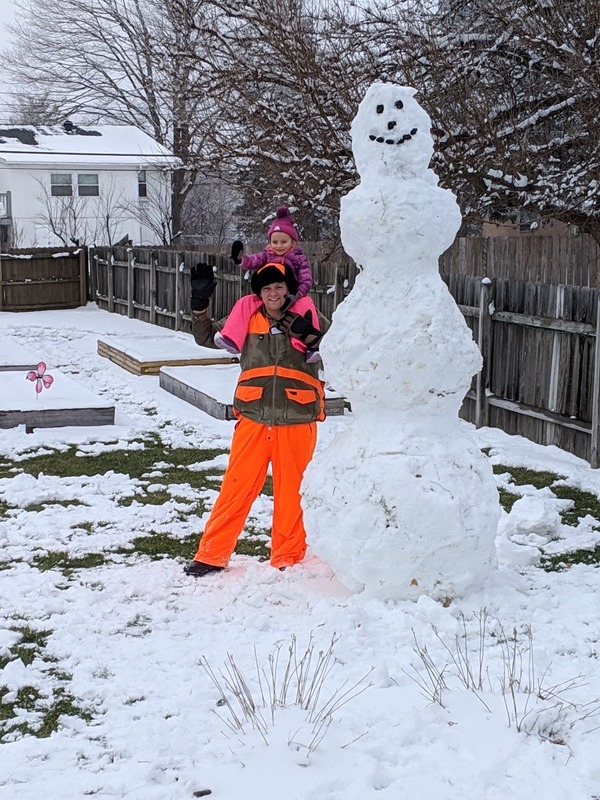 We turn colder, following the rain, and some light snow and flurries possible Saturday with highs in the mid 30s followed by a mostly cloudy and chilly Sunday. Have a good one!